The Twins' Room in the Nintendo 3DS remake. 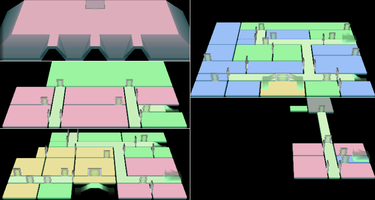 The Twins' Room (Japanese: 子供部屋 Nursery) is one of the many rooms in Luigi's Mansion. It is located in the first area, but Luigi cannot enter the room until he is in the third area. When Luigi enters The Twins' Room, he fights the room's occupants, the twins Henry and Orville. After Luigi captures the twins, he receives Mario's Shoe. The Twins' Room is small in size and filled with children's toys, such as trucks on the shelf, a helicopter mobile hanging from the ceiling, and a globe on a desk near the door. A pair of tennis rackets are in the corner next to a desk cluttered with books and a poster of the "Monsters" is on the wall. A Speedy Spirit is hiding in the bunk beds. The "Monsters" poster in this room appears again in the washroom on the second floor. In the 3DS version, the Washroom poster is replaced with a different poster depicting a field and some trees. This page was last edited on October 14, 2018, at 11:19.